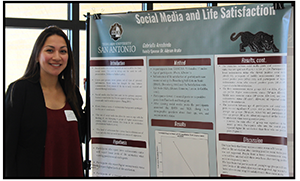 Welcome...to the Psychology program at Texas A&M University–San Antonio! Did you know that USA Today College found that psychology is one of the top three majors chosen by undergraduate students nationwide? In fact, according to 2016 Bureau of Labor Statistics, psychology jobs are estimated to grow in the next decade at an explosive rate – almost three times faster than the national average. In order to claim the title “Psychologist” and to build a professional career in psychology, many students will go on to complete graduate level training. However, many entry-level positions welcome students with a bachelor’s degree in psychology! Psychology, simply defined, is the study of behavior and mental processes. But we are a broad discipline with numerous subfields: clinical, counseling, social, sport, health, cognitive, comparative, biopsychology, neuropsychology, geropsychology, experimental, educational, engineering, industrial-organizational, military, and forensic – to name just a few! Psychologists can be found in nearly every occupational field you can imagine. The reason many students choose to major in psychology is because of its truly multidisciplinary nature. Our curriculum covers a wide range of theoretical and applied topics, and simultaneously provides hands-on research experience. This means that graduates are able to utilize their skills in a number of different careers – making a Bachelor of Science degree in Psychology particularly valuable! For those who intend to complete graduate study, our program provides an exceptionally strong foundation. Psychology is a diverse and challenging science. Earning a degree in psychology requires more than simply learning facts and theory: students must also develop a working knowledge and appreciation for the scientific method, while honing strong critical thinking, research, and written communication skills. According to Careers in Psychology, top jobs for psychology graduates include case manager, human services worker, rehabilitation specialist, psychiatric technician and school counselor. Many graduates choose positions in human and social services, business or education. A bachelor's degree, along with state certification, can also lead to a career as a high school psychology teacher. Reorientation – regaining one’s bearings after becoming lost – is a fundamental problem of navigation. During disorientation, the internal sense of direction is unreliable and lost navigators must reorient only using external cues. Of all the external cues available to reorient, geometry has been shown to play a predominant role across species, even when other directionally informative cues, such as landmarks, are present. My lab has studied the neural representations associated with reorientation in young and old animals. Our data indicate that lost animals need to recognize the context where they are and retrieve their facing direction within that context in order to reorient, two independent cognitive processes that are differentially represented in the brain. The ability to dissociate these processes decreases with age. Understanding the neural basis of reorientation may serve to develop therapies for patients suffering topographic disorientation. For more information tap here.